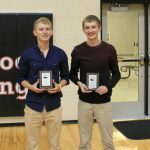 Boys Middle School Cross Country, Boys Varsity Cross Country · Nov 10 All-WIC Performers honored. Receiving the Outstanding Award at the Fall Ceremony were: Victor Burrell and Nathan Weller. This award goes to athletes who were able to achieve varsity status for all 4 years in their sport. 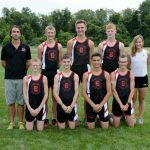 Boys Middle School Cross Country, Boys Varsity Cross Country · Nov 2 Young Boys XC ends season on high note. The Girls XC team finished 6th in the WIC meet. Freshman Paige Abel and Kaylee Meyer finished 5th and 6th to make the All-conference team. Paige, Kaylee, and Celine Hornick advanced out of the sectional to the regional meet. Paige and Kaylee also advanced to the semi-state.